People often accuse the Federal government of being an entrenched bureaucracy, which it is. They blame the bureaucracy for all of the government’s problems, but the truth is a bit more complex. After all, it isn’t the bureaucracy passing sweetheart legislation, it is our elected un-representatives. The bureaucracy may write the rules but it does not runs the show. Believe me, having worked in the bureaucracy my entire career, I can tell you it isn’t in charge. It is subject to enormous political pressures from elected executives, representatives and even the courts. No rules are passed without political sign off. Elected official send their political appointees deeply into the bureaucratic hierarchy to infiltrate and transform their missions. Politicians often say one thing and do another, using the bureaucracy as their cover. In truth, bureaucracies are only as good as the politicians we elect to run them. Obamacare is a great illustration of this. In states where the chief executive wants it to work the bureaucracy has created workable systems and overcome large obstacles to make it work. In states where the chief executive would like to see it fail the bureaucracy has made a hash of things. I call it planned incompetence. The bureaucrats were given a mixed mandate to create a faulty system to prove the politicians position that Obamacare doesn’t work and that government doesn’t work. Bureaucracies are tools that can be used for good or evil by people in power. 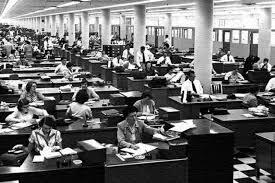 Bureaucracies are the interface between ordinary citizens and political rulers. Did you know that the modern bureaucratic government structure was established by an enlightened English King (one of the Henry’s) to assure that his erratic, sometimes irrational sons could not, on a whim, destroy the good government administration he created to serve his people? We don’t think much about it today, but bureaucracy still serves a vital, useful purpose in assuring the smooth and planful administration of government. The very characteristic most often criticized, its slowness to respond, is also its primary benefit. It methodically operationalizes the dictates of our political rulers to maintain continuity and order in government administration, not that it always succeeds. But if we didn’t have it we would be subject to every impulse of the chief executives and this would lead to real chaos in government services. So while I am quick and well experienced to criticize the bureaucracy, I am less inclined to condemn it. They are still small in number, but spread widely across the county. They are articulate, highly motivated and influential members within the Tea Party, the Christian right movement, Libertarians groups and nationalist groups in every state. They are the philosophic rear guard of the conservative movement pulling conservatives ever further to the right. They may not have a central organization, but they do have a significant social media presence. They remain under the radar of the national press which fails to take them seriously. The best way to find them is to type “secessionist” into your internet search engine. They are the Neo-Confederates, a polarizing counter-force behind the growing rift in the Republican Party. The secessionists anti-government interests overlap with the corporate conservative wing of the Republican Party, and both groups favor free market economics, but the graycoat conservatives envision a very different America. So while wealthy conservatives continue to fund the Tea Party, graycoat conservatives are busy winning over hearts and minds to their radical alternative. The following graphic is taken from one of the many secessionist Websites. It maps the number of secessionist petitioners from around the country. In effect it shows where they are most active and how they are distributed across the country. It doesn’t represent how popular or unpopular the movement might be. Signers to White House secession petitions by county. Color based on proportion of residents signing, with darker colors showing higher levels of secession support. Current as of 9am on Saturday, November 24th. Works best in Chrome or Safari. Update: It looks like the secession petition movement has peaked. What these secessionist groups most have in common is a desire to facilitate the collapse of the Federal Government and the breakup of the Union of States. They see this as the natural and inevitable course of history. As they see it, every great empire has followed this path. According to one person who wrote me, they are, “… committed to the cause of individual liberty and [individual] sovereignty. 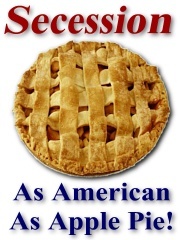 [They] would prefer secession, to revolution.” But revolution it will be if the majority opinion of the Americans go against them. They have a strong patriotic connection to our founding fathers even though their commitment to our Union is weak. Pin them down and they reluctantly choose the union of states over a return to a confederacy, but only if the Federal governments control over the states is weakened and individuals are free from all federal interference. If you start to pin these folks down in a debate they squirm away. They are viscerally opposed to the our system of government, their anti-federal rage concealed only by their passion for an extreme interpretation of individual rights and freedoms. These passions are covered over by a thin veneer of selective scholarship. Scratch the scholarship and their passion flares. Challenge their constitutional interpretations and they circle the wagons. They have no sense of responsibility towards society and nothing but contempt for majority rule. They believe the majority of American’s is just another special interest group, and one that is biased against minority rights. When majorities opinions prevail they force minorities to accede to their will which violates their rights. This is how they interpret the Constitution. The only legitimate role they see for the federal government is the protection of the individual’s right to follow their conscience within Constitutionally defined boundaries. One major flashpoint seems to be taxes. They don’t want to pay any federal taxes, but when pressed say they agree to contribute only for spending within the limits of their narrow interpretation of the governments enumerated powers. Tenth Amendment: The powers not delegated to the United States by the Constitution, nor prohibited by it to the States, are reserved to the States respectively, or to the people. Disdain for the Federal Government or any large democracy is a central feature for these neo-confederate groups. They see majority as a special interest and would strip the government of its ability to show any favoritism to all special interests. This suggests that the only role of government must be the protection of the individuals rights yet they may concede collective rights to businesses. Perhaps this is why it is so important that corporations be viewed as people. It gives them individual status while denying other types of organization status as a collective entity. Because questions keep coming up as to the kinds of states that secessionist organizations are working toward, and because each organization in the movement has an interest in the objectives of any other organization, it seemed to us here that it might be appropriate to send out a suggested platform of the rights and freedoms that might be guaranteed to individuals in any future seceded state. [SNIP] There are important issues here and we hope you take them seriously. In the face debt ceiling financial cliffs, government shut downs, and the nearly total inability of Congress to pass legislation, it is time to recognize that there are forces on the far right, and in Congress, who see this as successful strategy. Their intentions are malevolent and quite contrary to the motivations most often attributed to them by political analysts in the main stream press. It is time to pay attention to these groups and their impact on American politics. A failure to open a public debate that directly confronts both the graycoat secessionists and the corporate elite now would be a huge mistake. Most people pay attention to pocketbook issues that affect our family or retirement, but quite understandably avoid the rancorous politics we see on TV. There is a sense that government is failing because elected officials can’t agree and the country is evenly divided, but many important issues do get rationally settled in the opinion of vast majorities of the public. For example,a large majority agree that global warming is happening and we are causing it in some way. Almost 90% of us agree we spend too much on defense. Large majorities believe we should generate more electricity from wind and solar. About 80% of us believe there should be universal background checks on gun sales and almost everyone agrees that big banks caused the great recession. Despite a near consensus on these and other issues there is gridlock in Washington. One explanation is that there is not a lot of passion behind these majority views, so meaningful change against an organized and well funded opposition is out of reach. In the face of majority agreement, Congress fails to act, or act contrary to the will of its citizens. On the surface it may seem like political gridlock between evenly matched forces, but this is an illusion. There are many issues supported by majorities in both parties that can’t even get a hearing in Congress because a tiny minority who oppose it are able to kill it. This is tyranny by the minority when the majority isn’t allowed to govern. To understand what’s happening really requires us to pierce the noise of partisanship and media bias. The voting majority has lost its ability to govern. In frustration more and more ordinary citizens feel alienated or betrayed, leaving us vulnerable to the radical fringe. Evidencethat the majority has lost the ability to govern is everywhere. The smallest special interest group, the wealthy elite, are by far the most influential and obvious force in Congress. CEO’s of major corporations testified in Congress that they don’t want or need tax subsidies and Congress increases their subsidies. Wall Street asks for and got billions in bailout money with no strings attached. Try to attach some strings or implement substantial financial reform and Congress kills it, either outright or later on through the budget process. There is evidence of the failure of majority rule in the way the filibuster has shut down open debate and killed popular legislation. There is evidence in the inability of Congress to debate and vote on immigration reform, which is popular and has strong bi-partisan support. The debt ceiling crisis, the budget cliffs and the government shutdown are all signs that the majority has lost control of the federal government. The growing assault on voting rights, recently passed anti-abortion legislation and the imposition of emergency managers over democratically elected city and municipal leaders are other examples. The truth is forces on the political spectrum are not evenly matched. Many political battles are asymmetrical. The nations shift to the right is mostly due to the success of highly motivated and well funded conservative action groups. For example there are right wing Christian groups opposed to secular society and what they see as moral decay. These groups promote socially conservative issues. There are Tea Party groups opposed to taxes. They promote free market capitalism and limited government. Then there are many extreme nationalists groups, gun rights groups, militial groups and the like. All of these groups have different aims but are drawn together by strong anti-tax, anti-government sentiments and by at least a laissez-faire view of capitalism. Money and organizational clout for these action groups comes mostly from wealthy capitalists who want to weaken the power of government to tax and regulate commerce. There is an anti-government alignment of interests between the wealthy elite and each of these groups. There is another, less visible segment in these groups as well, a far right group with a welll defined ideology but no central organization. These are the real insurgents fighting for control of the Republican Party. Their goal is to dismantle the Federal government as we know it, limiting its powers to the narrowest extent possible under their interpretation of the U.S. Constitution. They are the members of the Tea Party who pull it further to the right. They are the members of conservative Christian right groups that fan the flames of anti-government rhetoric. Some belong to hate groups, conservative issues groups or libertarian organizations. Everywhere they show up they agitate to pull the organization further to the ideological right by sowing dissatisfaction with our Federal government. They seek an individual level of freedom that transends any personal responsibility to society or majority rule. Who are these far right ideologues and what do they want? Imagine a future in which our Federal government is forced to cut back on every service or function not specifically named in the U.S. Constitution. What if, to keep Wyoming and a few other Mid-West and South-Western states from seceding, we give up our national parks. These are sold off to corporation such as Disney, ExxonMobil, Boise Cascade, Massey Energy Corp. and various land development corporations. Under this scenario Texas or some other states may have already seceded and we now have to worry about the nuclear armed country of Texas on our southern border. Imagine the Federal government no longer able fund departments and agencies over the objection of a minority of sovereign citizens. Gone are the Departments of Education, Energy, Housing and Urban Development, Health and Human Services, Interior, Labor, Transportation.. all gone and replaced by individual state control, subject to the ability to fund them over the objections of “sovereign citizens” in each state. The Environmental protection agency, The FDA, FCC, SEC and almost all federal regulatory agencies would all be gone. These are considered outside the enumerated powers of the Federal government. Medicare, Medicaid and Social Security are obviously gone as well. It is up to the sovereign citizens of each state to decide what they decide to fund or not fund within their own state. In this future all Federal powers would be limited strictly to military defense, protection of the rights of individuals with respect to constitutional liberties and settling interstate commerce disputes among the states. In this future citizens could target where their tax money goes. 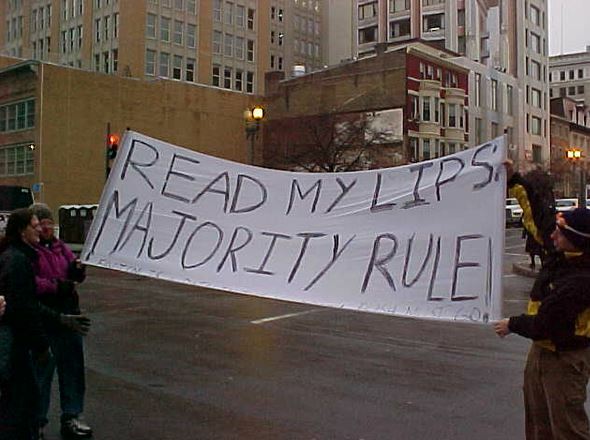 In effect, majority rule would be subject to minority consent, in fact to consent by each sovereign citizen’s consent. Continued in Part 2 – Meet the Gray Coat Conservatives.